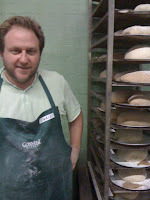 Recently my brother organised for both of us to go to the Abbotsford Convent Bakery to tale part in a Bread Making Workshop. On arrival you sit down to a freshly made latte, and wait to get into the full day of kneading, baking, eating and more. The convent bakery uses the old ovens the nuns used to run in their day to day lives cooking for the convent and all of it's inhabitants. Although the ovens were not specifically made for the baking of bread, the results we encountered on the day were amazing. Our instructor for the day was chef Dan Thyer, and the course started with making scones for our morning tea, and they were magnificent. The secret to a good scone is not to overwork the flour. we sat down and ate these with whipped cream, jam and another coffee at a big table with all the other particpants. nto 10 portions and roll each portion in to a ball. These can be rested for up to half an hour if you don't want to bake them straight away. Bake for 12 -15 minutes. Next was pizza dough! I decided to make half white/ half wholemeal and result was great. One of the best tips I received from Dan in making the pizza was sprinkling a fine layer of semolina on the tray underneath your dough. Not only does it stop the pizza sticking, it gives an extra crunch to the base. Combine all ingredients in a large bowl. With both hands, mix it until it forms a ball of dough. Take the dough from the bowl and place it on the bench. Knead the dough for a further 15 minutes until the dough is developed. Place the dough back in the bowl and cover it for a further 2 hours so it can proof. Split the dough into 2 or 3 pieces according to what size pizza/calzone you are making. Flatten the dough to fit the shape of your tray. Baste the dough with garlic flavoured olive oil then pizza tomato sauce, leaving a half inch border around the edge. Cover the pizza with your choice of toppings (I used pepperoni, fresh tomato, artichoke, marinated red peppers and olives) then sprinkle over cheese. Don't over-do it with the topping or you will have a soggy pizza. Bake at 230°C for 12 - 15 minutes. For the calzone, only cover half of the dough with topping. Fold the unfilled half over the filled half and press the edges together. Cut 3 to 4 slits in the top of the calzone to let the steam escape and bake as for pizza above. Now down to the serious business of baking a real loaf. I have had some success with this at home already, and had put the limited success down to an inferior oven. 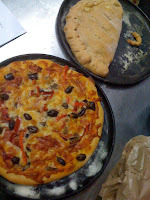 However during the course I realised that the kneading, proofing and shaping techniques I had been using were the problem. Firstly finding the right balance of moisture in the mixture is vital. While the amounts in the recipe are correct, you need to go by feel. If it is too dry, the dough will not knead as freely, and if it is too wet it will be too hard to handle. If in doubt wetter is better! The other thing that helped the bread taste fantastic was using a real sourdough culture [levain] The starter we used at the class was the convents own culture that has been alive for about 10 years. There is apparently a bakery in San Fransisco that has one that has been alive for over 100 years! To make your own starter culture click here. This link is pretty good and offers sound advice. I have yet to make my own culture but I plan too very soon. The final difference I discovered in making great bread was how you shape your loaf. Once it has proofed, you roll it out into a rectangle and then fold it over on itself like you were starting to make a paper aeroplane, then roll it up, turn it on its side, and push the sides down to make one join at the bottom. The shape it and leave to proof. finally you can cut the top to add shape and also to control the cracking that is inevitable. Mix and form dough then place on the bench and knead for 15 - 20 minutes. Place the dough into a bowl sprayed with olive oil and cover for 2 hours for proofing. Your dough should double in size during this time. 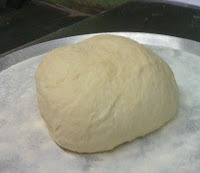 Place the dough on the bench and give 10 minutes to rest before molding into shape then final proofing for 45 minutes. Bake at 210°C for 30 - 35 minutes. Overall I would highly recommend this workshop.